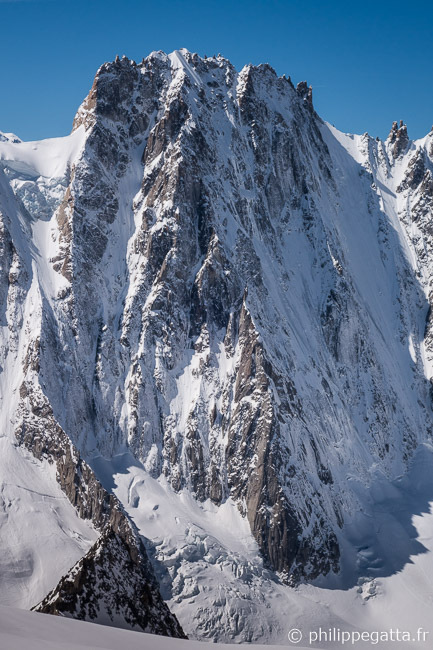 The Mont Blanc Massif is a mountain range in the Alps. 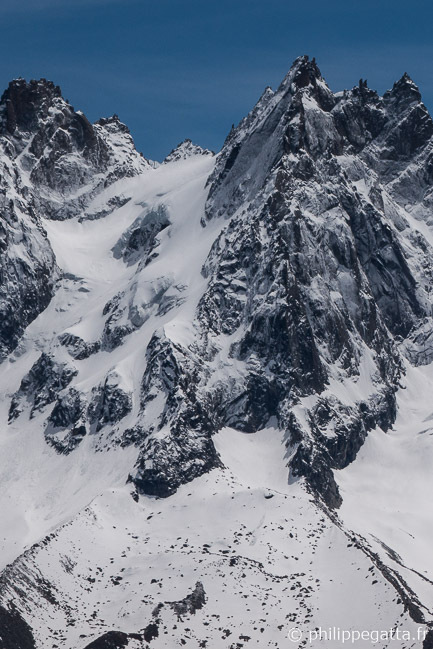 The Massif is located in France (Chamonix, Haute-Savoie), Italy (Courmayeur, Aosta Valley), and Switzerland (Valais). 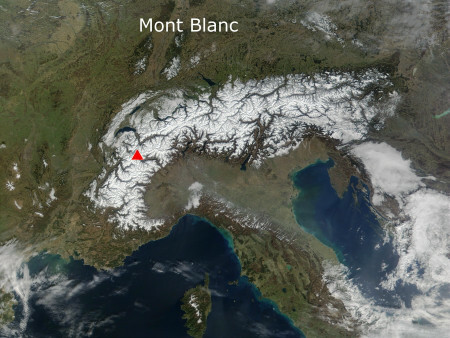 Mont Blanc is the highest peak in the Massif with an elevation of 4810 m (15,774 feet). 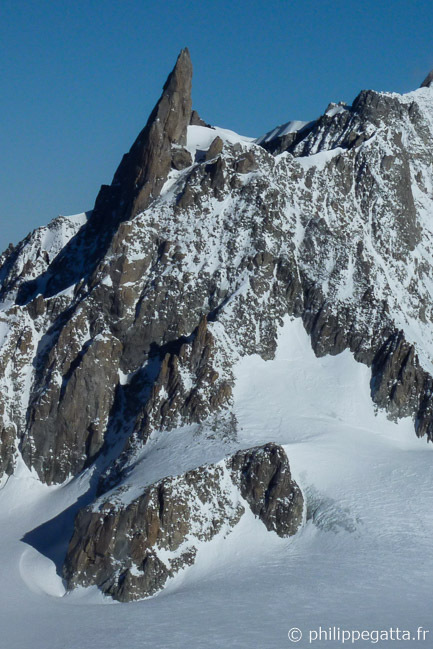 The Aiguille Verte is one of the most beautiful peaks of the Massif. Several of her Couloirs are very famous; Couturier, Cordier, Whymper, Y... Note that there is no normal "easy" route which makes the descent tricky. Grade: D / IV / 55°. 1000 m.
The first day join the Argentière hut from the Grands Montets cable car. The second day, join the bottom of the couloir (1h30 to 2h from the hut). There are lots of crevasses and the rimaye can be difficult to pass. Then climb the couloir at best depending on the snow and ice conditions. The first part is 45-50° step, then the couloir gets stepper up to 55° going toward the right, the nit becomes less steep. Grade: AD+ / IV / 50°. 600 m.
First day: from the Montenvers, follow the Mer de Glace up to the junction with the glacier of Leschaux. From there, go up along the glacier of Talèfre (ladder) to the Couvercle hut. 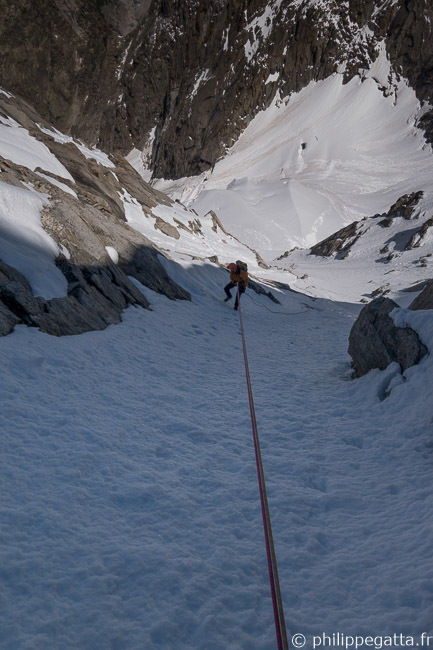 Second day: join the bottom of the Whymper couloir on the Talèfre glacier. 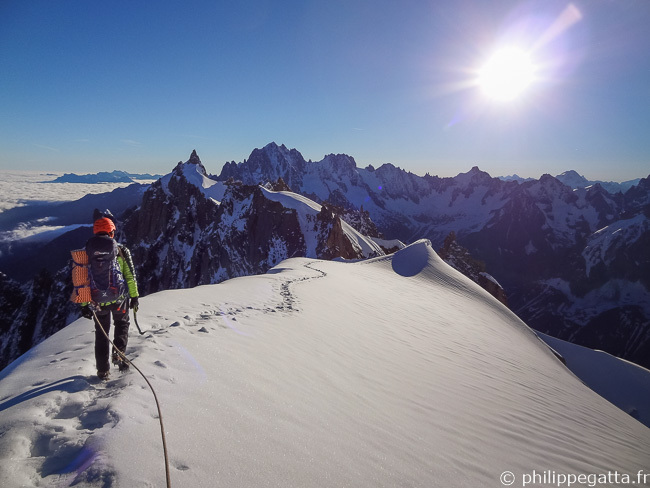 Stay close to the Ecclésiastiques ridge. 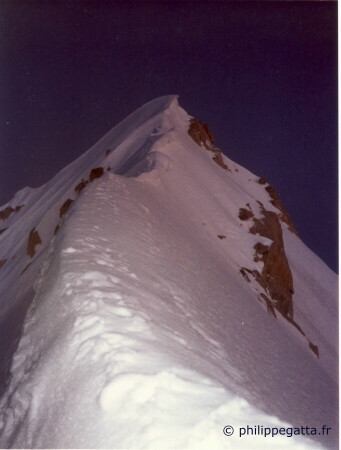 Pass the rimaye on the right and climb a small couloir. Leave it for the main couloir. Climb it to the col. 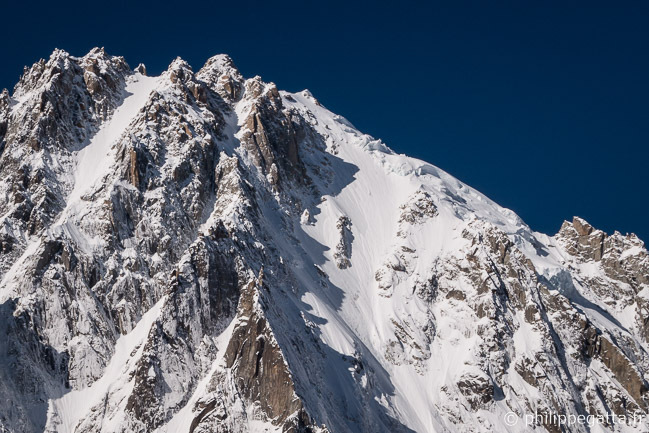 Follow the ridge to the top of the Aiguille Verte. Grade: AD+ / IV / 50°. 300m. 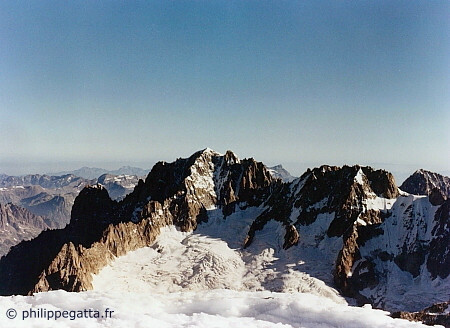 From the Plan de l'Aiguille, traverse to the left toward the Aiguille de Blaitière. Climb the moraine then the glacier of Nantillons (crevasses et exposed to ice falls) up to the bottom of the Spencer couloir. 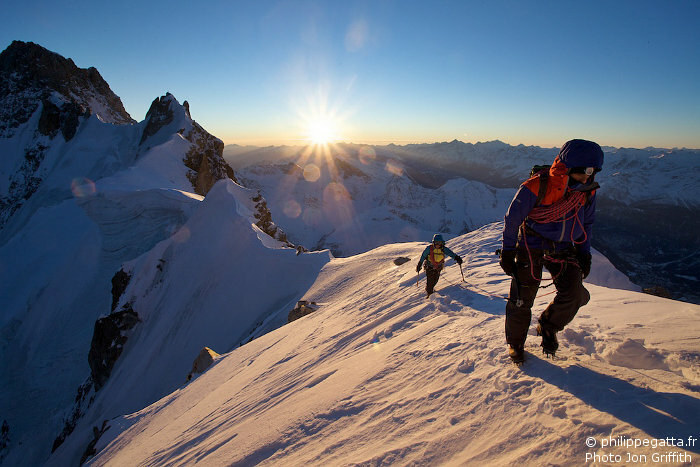 Pass the rimaye and climb the couloir to the pass. Climb the rocks to reach the top. Grade: AD / III / 40°. 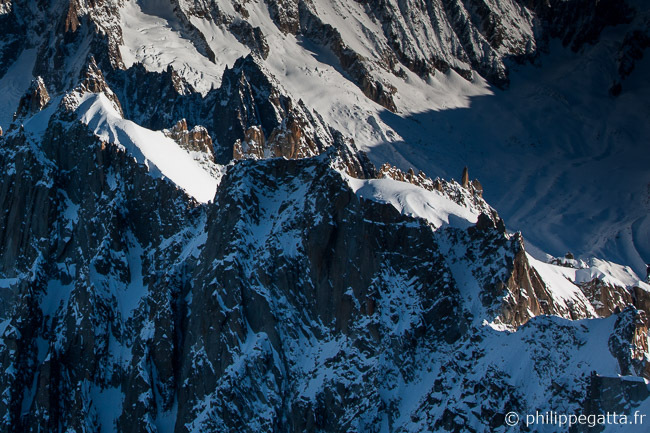 From the cable car of l'Aiguille du Midi go down along the ridge to the col du Plan. 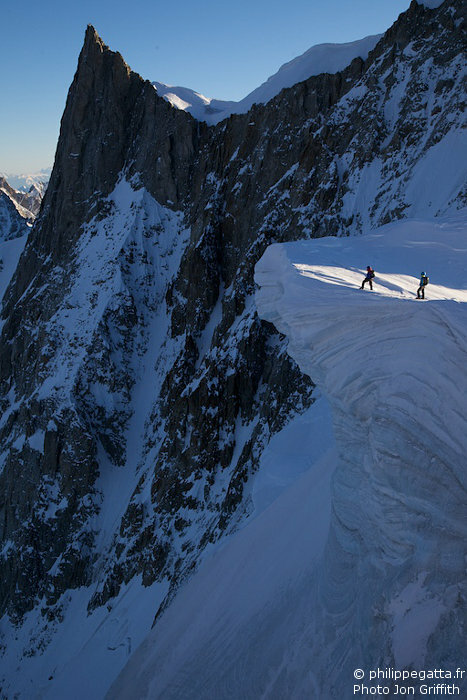 Continue on the ridge on the Chamonix side, climb a few rock and a snow or ice slope. Continue on a couloir to the Rognon du Plan (3 605 m). Continue on the ridge, abseils 2 or 3 times to the Col supérieur du Plan. Follow the ridge to the top of l'Aiguille du Plan. Grade: AD / IV / 50° / rocher III+. 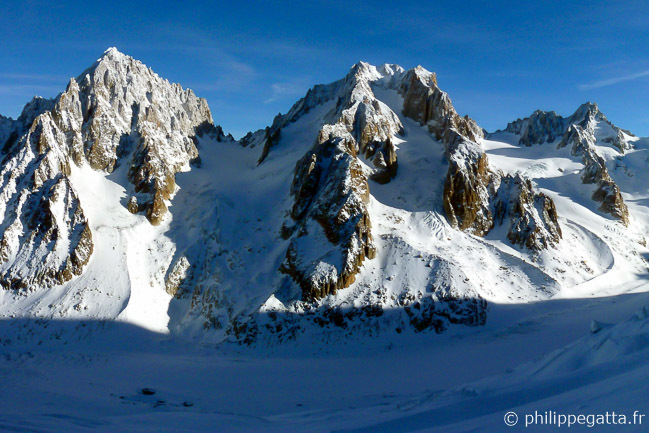 1400 m.
First day: start at Planpincieux and take the trail to the Boccalatte hut until you reach a cliff (2 100 m). Go toward the right and climb a slope up to the hut. Around +1400 m of ascent. 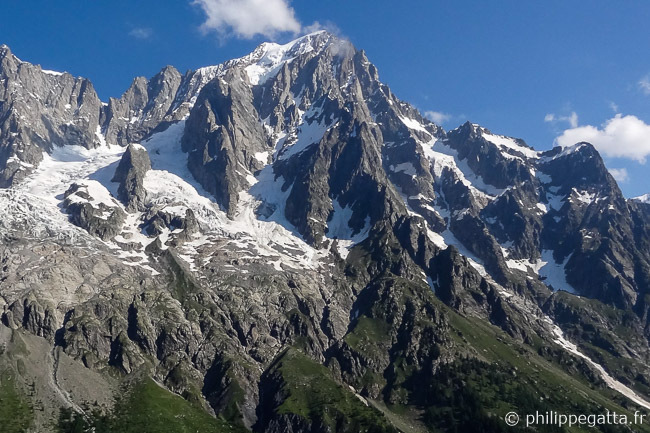 Second day: join the glacier of Planpincieux and climb it staying close to the Rognon de la Bouteille until you reach the Reposoir spur. 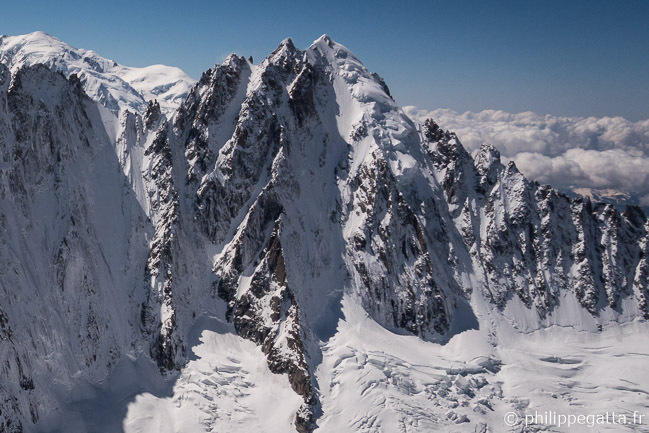 Climb it on the right (III), continue toward the large dihedral coming from Pointe Whymper and climb it (III). 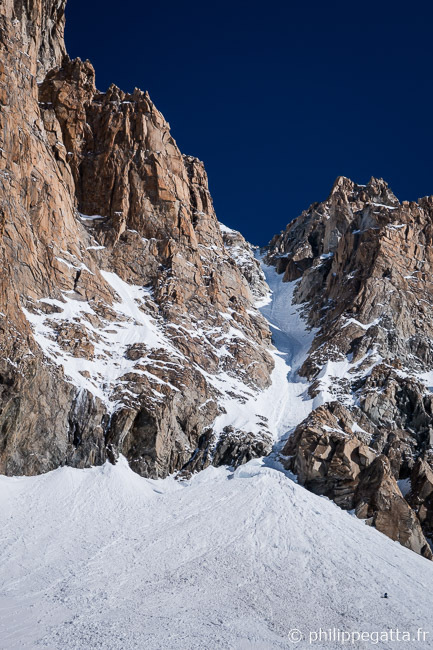 Continue either by a snow couloir on the right of the Pointe Whymper, or climb the rocky ridge till the top of Pointe Whymper then traverse to the right to the Pointe Walker, top of the Grandes Jorasses. Grade: D- / III / rock IV-. 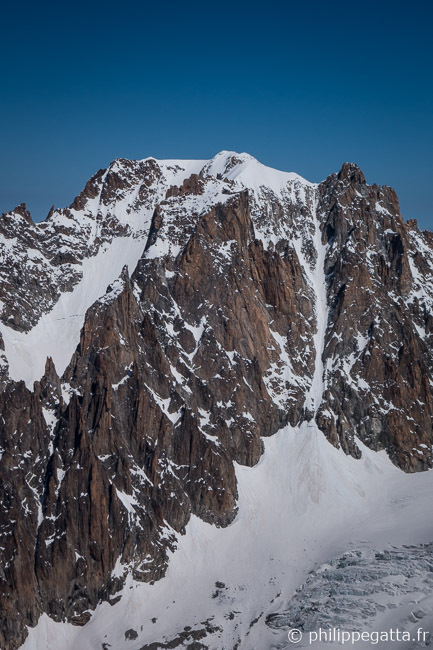 160 m.
From the Torino hut cross the glacier du Géant, let the col du Géant on the right and climb a snow slope followed by a couloir to a pass on the right of a Gendarme (rocky tower). Join and follow the ridge. Avoid another Gendarme by the right and follow the ridge to the Salle à Manger. Follow a shelf lower on the left and traverse to the 1st anchor. Climb toward the left for ~15 m following a few spits (IV+/V) to the old normal route up to the end of the first pitch. 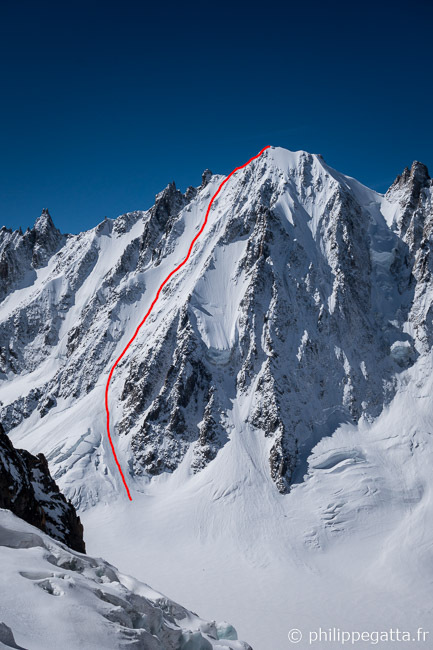 Climb a couloir up to a large shelf (~30 m, IV/IV+). The rest of the route has fixed ropes. Climb the Plaques Burgener (50 m) up to the third anchor. Climb a bit then traverse to the right to a steep dihedral to the 4th anchor. Climb a chimney then the ridge (IV) to the Selle Point. Descend another chminey, climb a small wall to the top of Dent du Géant. Grade: AD / III / 45. 600 m.
From Torino hut follow the Dent du Géant's route up to the Salle à Manger. Then follow the ridge, sometimes very narrow to the point 3 933 m. Descend for about 20 meters, cross a rocky point to the right. Continue to the bottom of the Aiguille and climb a couloir on the right (1st pitch). 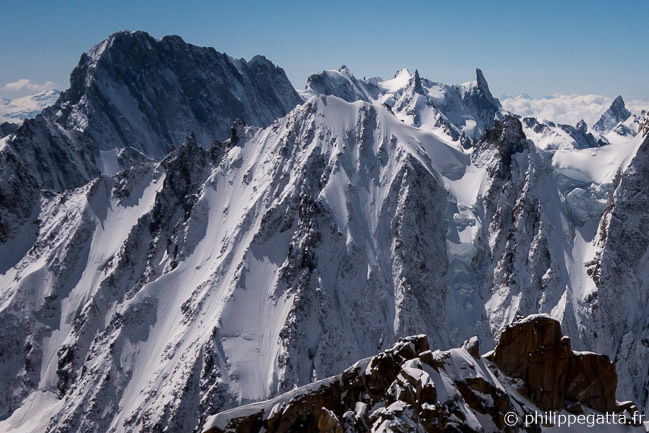 Join the top of Aiguille de Rochefort in 2 pitches, on the left first, then along the ridge. Grade of Y Couloir: AD / III / 50°, 450 m.
First day: from the col des Grands Montets go to the right and descend on the glacier des Rognons (South of the moraine des Rognons). Continue to the glacier d'Argentière, then go up to the Argentière hut. Second day: from the Argentière hut climb toward the col du Tour Noir. Before the pass, go left to the bottom of the couloir Y and climb it (see the photo on the right below). Descend by the glacier du Milieu. Second day: from the Argentière hut climb to the bottom of the glacier du Milieu. Climb the glacier du Milieu first on the left, then on the right. Pass the rimaye and climb the slope up to the crest between the two summits. 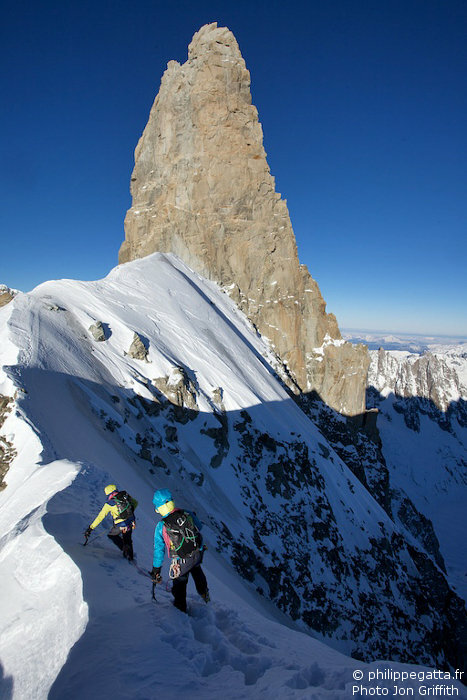 Join the main summit of l'Aiguille d'Argentière (see the left photo below). Second day: from the Argentière hut descend on the glacier d'Argentière, cross it and climb toward the bottom of the Northeast face of les Courtes. Cross the rimaye and climb the face. Toward the end go to the right and join the summit ridge, climb some mix terrain up to the top.